When building started at Meroogal in 1885 - the same year Nowra was proclaimed a town - an underground tank was constructed adjacent to the back verandah. Referred to by its owners as 'the well', it played an important role in the life of the Thorburn women as a water source and cooler: a place to store perishable foods and set jellies. 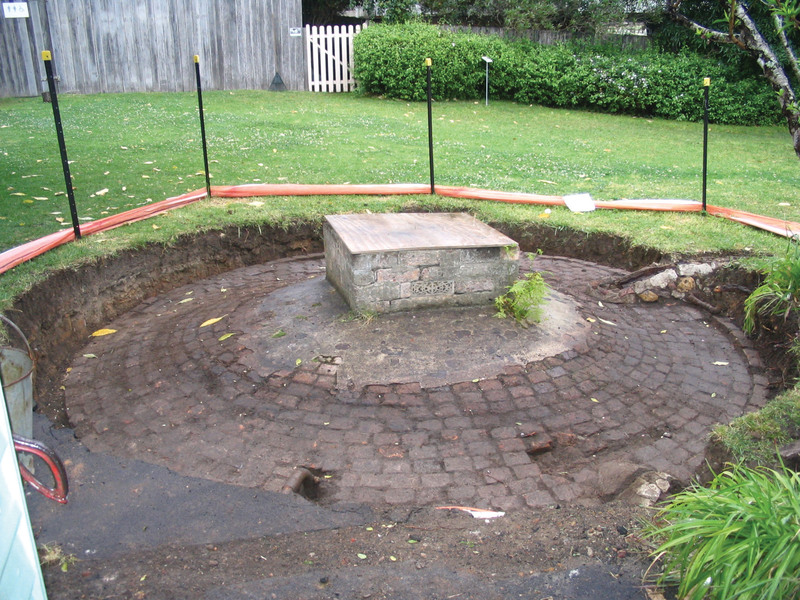 Although Meroogal was connected to town water in 1912 the well, together with a smaller tank. continued to be used as the main water supply for the property for some years. The well has a capacity of about 40,000 litres and is covered by a shallow brick dome constructed of bricks laid on end. Half of the dome protrudes above the ground and the central opening to the tank is concealed in a square brick turret with a lid of thin concrete slabs. A cast iron pump (still working) near the back door was used to draw water from the tank. A 1920 photograph shows one of the Thorburn sisters (either Georgie or Kate), her face obscured by a wide brimmed hat, with her pets, perched on the timber lid of the well. It was this photograph that drew attention to original lid construction and the extent of subsidence of the dome, and led to an investigation that culminated in the restoration of this very important water source. This article was written by consultant architect and engineer Nick Powell and original published in the Autumn 2006 issue of Insites. Several reasons were identified as the cause of the subsidence. Over the years the pressure of the surrounding soil on the dome had gradually distorted it. Diversion of roof drainage in the mid 1980s when HHT acquired the property caused the water level in the tank to drop and subsequently by the mid 1990s there was a noticeable depression in the ground. By 2005 this had become quite pronounced. After consultation with the property's architect Mark Jones, and structural and civil engineer Robert Griffiths, the HHT considered a range of options. The solution agreed upon struck a balance between public safety, conserving the existing fabric and retaining the structural integrity of the well. An internal steel frame was to be inserted into the tank to prop the underside of the dome, and a reinforced concrete ring beam was to be put around the tank to prevent further outward movement. 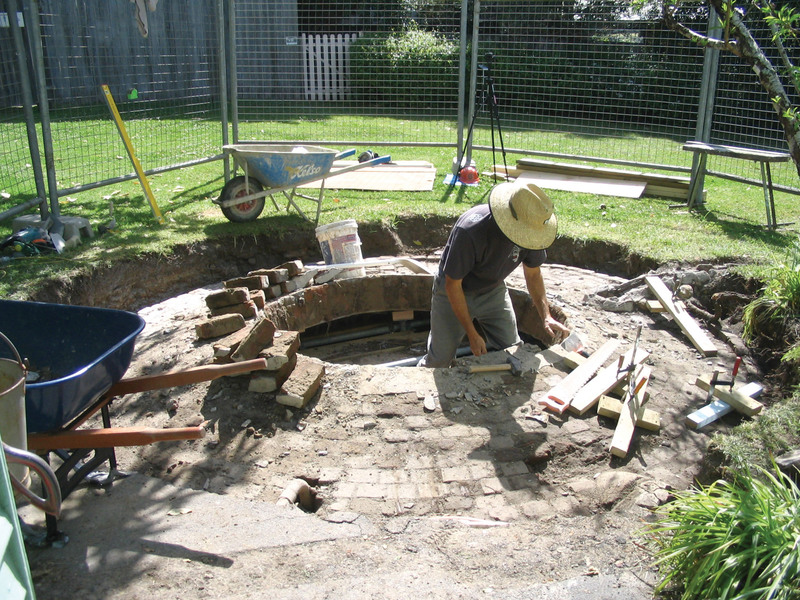 In times of prolonged water shortage this will make Meroogal a more sustainable property and suggests that old wells such as these, providing unobtrusive storage for large volumes of water, are just as valuable today as when they were first constructed. 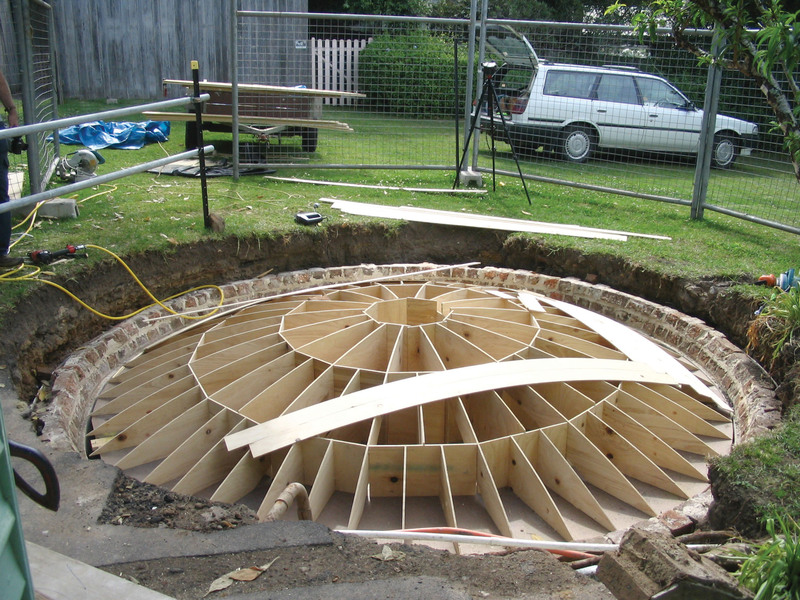 Underground cistern, in danger of collapsing, is carefully exposed, prior to reconstruction works, 2005. Underground water tank being dismantled, 2005. 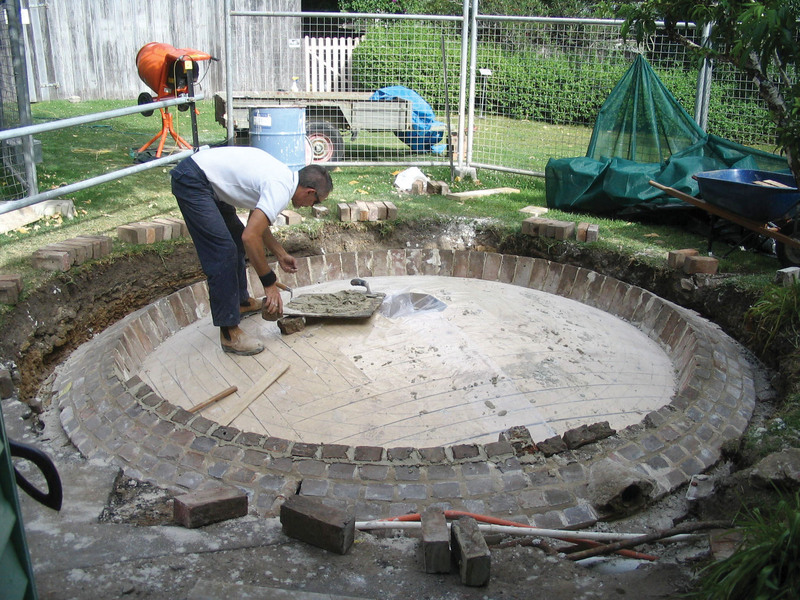 Underground cistern, partly demolished, being re-bricked. 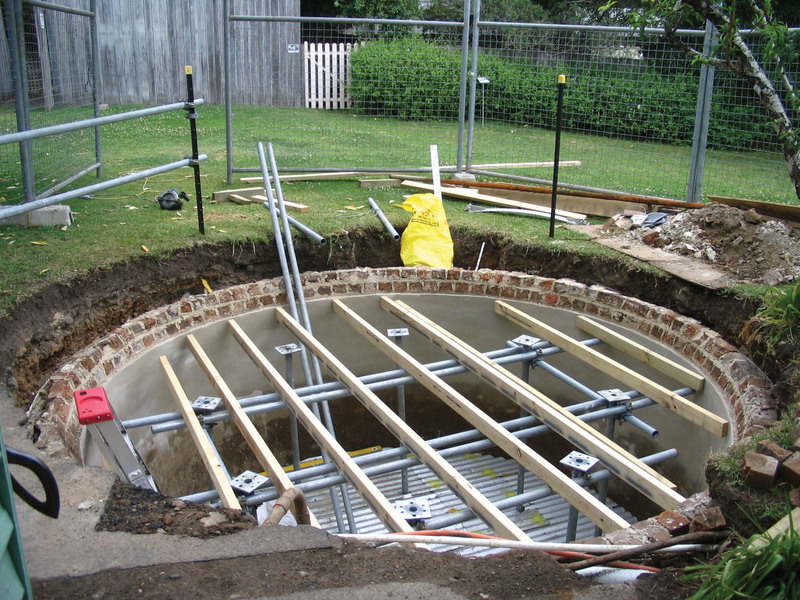 Temporary framing in place for roof reconstruction of underground cistern, 2005. Structural ply panelling in place over roof framing for cistern roof reconstruction, 2005. Curved ply vertical framing sheets being assembled, 2005. Lining membrane being laid over curved vertical sheets, 2005. 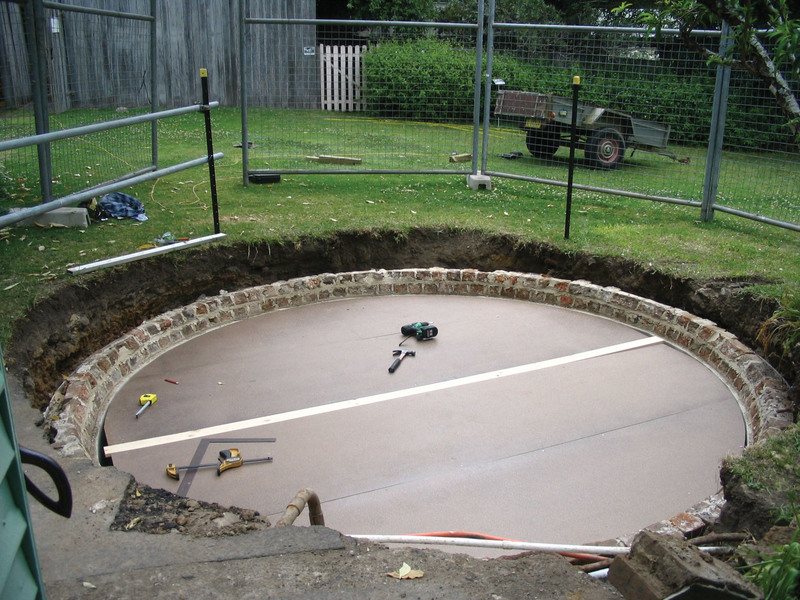 Lining boards fitted to curved framing sheets, creating a domed membrane, 2005. 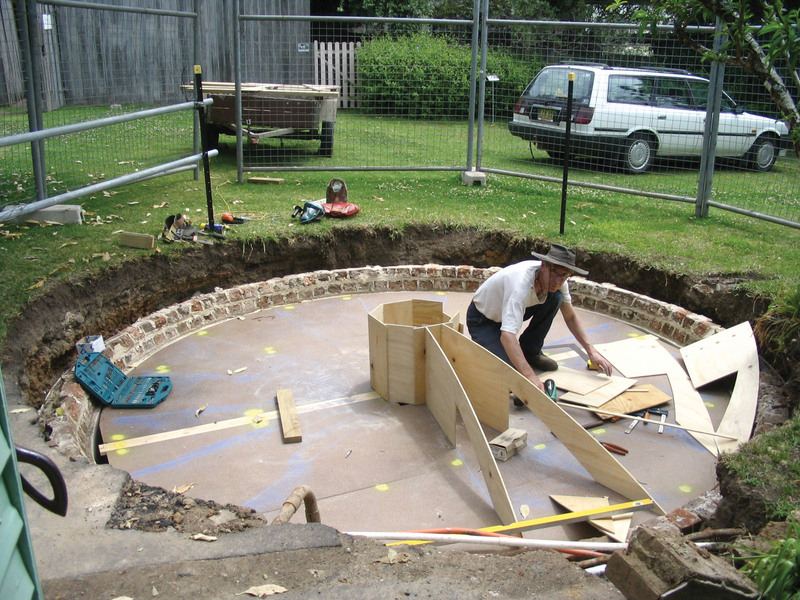 Brickwork being carefully laid onto dome-shaped membrane, 2005. 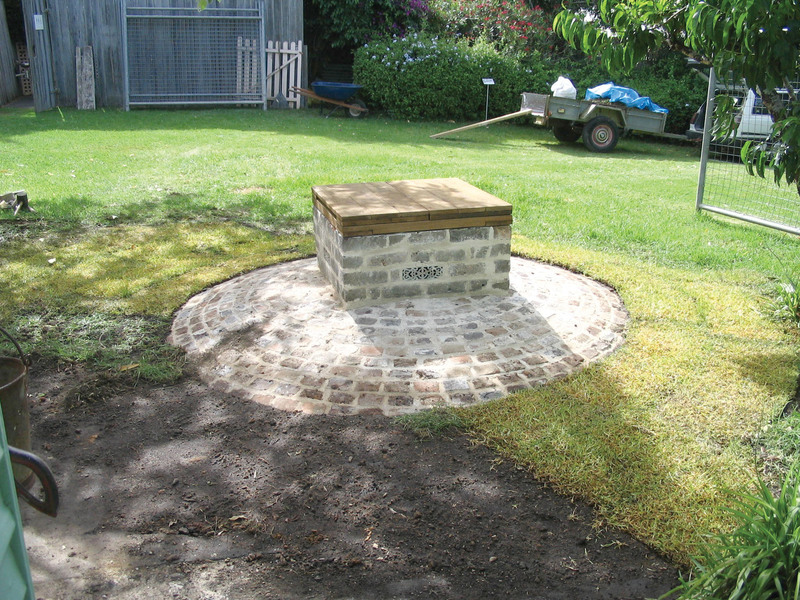 Recently laid turf taking hold over newly completed brickwork, complete with square access shaft and timber lid, 2005. Inserting the steel frame allowed closer inspection of the internal structure of the dome and wall of the well. Additional excavation confirmed that the dome was gradually falling into the chamber and that in some areas it was so distorted that the upper surface had become slightly concave rather than convex. In light of these observations the HHT decided that the most appropriate course of action would be to dismantle the damaged parts of the structure and reconstruct it in its original form, using early photographs as a guide. The internal steel frame supported both the dome during dismantling and the working platforms that provided safe access within the chamber. The brick turret was dismantled and each brick set aside so it could be returned to its original position. Each course of the dome and the top six courses of the wall were removed and stacked for cleaning and re-Iaying. Following the re-Iaying and rendering of the upper wall. plywood falsework was erected to facilitate reconstruction of the dome. A stainless steel band was incorporated into the structure at the perimeter of the dome to prevent it collapsing again. 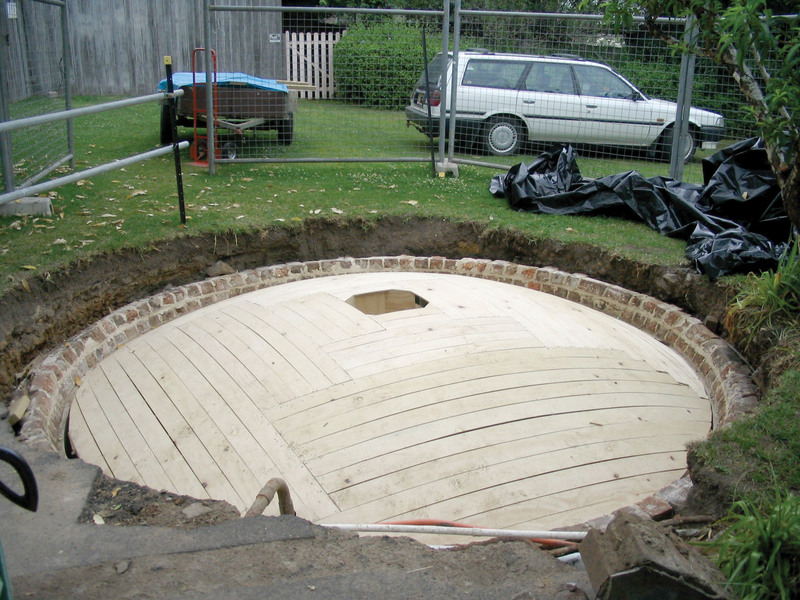 Soil was replaced around the dome and a new timber lid constructed to match the original. The reconstructed dome closely resembles the structure as it appears in early photographs but most of the richness of the surface and the intricate record of 120 years of wear and weather is unfortunately lost. However, the project was successful in other ways: it used the expertise of HHT staff from a number of properties and the whole process was documented extensively on video. The reconstruction of the dome has given the HHT the opportunity to review water practice at Meroogal, especially important in a time of drought and greater community awareness of conservation of this precious resource. Modern pumping equipment has been installed in the tank, making the water stored in it available for use on the Meroogal garden. Plans are also in place to rebuild the small tank that once serviced the upstairs bedrooms and later the tenants' kitchen. 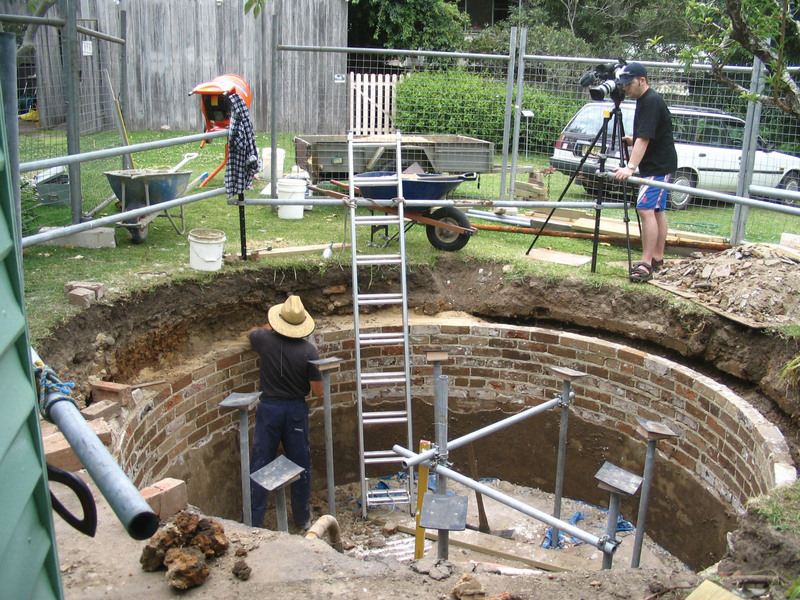 In times of prolonged water shortage this will make Meroogal a more sustainable property and suggests that old wells such as these, providing unobtrusive storage for large volumes of water, are just as valuable today as when they were first constructed.